By various estimates, there are about 1.5 million to 2 million American Muslim voters, including several hundred thousand Pakistani-Americans, in the United States. The estimated number of people of Pakistani origin in the United States ranges from 250,000 to 500,000. The top three geographies are NY/NJ/CT tri-state area, Chicago metropolitan area and Southern California. Pakistani Americans are the seventh largest Asian American ethnic group after Chinese, Filipinos, Indians, Vietnamese, Koreans, and Japanese communities. Pakistani-Americans are the second largest Muslim group in America after African-American Muslims. There is a significant concentration of Muslim vote in the swing states of Florida and Michigan. If, as the anecdotal evidence suggests, Obama gets the lion's share of the Muslim American vote, then he could win the presidency by a thin margin of Muslim votes. Now, the new president of Pakistan, Zardari, has got his hands full. And this area on the border has not been governed since the days of Alexander the Great. From this debate transcript and prior statements, it is clear that Sen McCain is far more knowledgeable about Pakistan than Senator Obama. Mr. McCain has also repeatedly stressed diplomacy and close working relationship with Pakistan and demonstrated his commitment by his actions such as several visits and phone conversations with Pakistani leadership recently and in the past. On the other hand, Mr. Obama has made aggressive statements about Pakistan without making serious effort to understand the issues faced by Pakistanis in FATA. 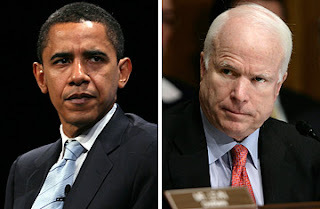 Beyond the debate specific to Pakistan policy, the most oft-repeated phrase by Senator McCain was “I don’t think Sen Obama understands”, while Obama repeated “I agree with John” more often than any other phrase. Just these two phrases capture the essence of the tone of the debate on foreign policy. From this debate transcript and prior statements, it is clear that Sen McCain is far more knowledgeable about Pakistan than Senator Obama. Disagree Riaz. Seems your horror with Obama's wanting to invade Pakistan statement is clouding your judgment of him in general. He says "for 10 years, we coddled Musharraf, we alienated the Pakistani population, because we were anti-democratic." That is the truth. And isn't that in line with what you advocate i.e. engage the Pakistani people rather than take the easy way out? I have been to FATA and I have seen how things are done there. I also know how any perceived threat by the US in Pakistan would be clearly counterproductive. Diplomacy that deals with winning Pakistanis' support will be essential for any success in FATA. McCain's statement clearly shows he understands it too. Obama knows too little to talk about dealing with this crisis. I also agree with McCain that Pakistan was a failed state before Musharraf after years of misrule by Bhutto and Sharif. McCain clearly knows what he is talking about. Obama doesn't. His presidency will be dangerous for world peace. Agree with Libertarian, here. Your judgement about Obama is clouded by the old school thinking that "a Republican president is better for Pakistan". When deemed necessary, any presidential candidate will order strikes in Pakistan. Make no mistake. And yes McCain is much more knowledgeable but what does that count for? Bush didn't even knew the name of our president when he was running for president. Just listen to Obama! He is far more intelligent than Bush or McCain. If Bush can learn about foreign policy while in office, Obama can do so as well. Can the world afford another Republican president for four more years, dictated by Neo-cons? Can we afford evangelical, extreme right- wing conservatives dictate US policy? Do we need another George W.Bush? Obama is better for the whole world! Obama is a great analytical guy..he grasps things very fast and he got Biden by his side for giving him best advise on South Asia. John McClain is a cold warrior and with his compulsive antagonism against Russia, he is going to screw America into another vicious cold war. Bush administration wasted all its efforts in Iraq, though nerve centre of terror is in Pakistan. US intelligence and marines on the ground have for long alleged that Pakistani military were airlifting(and using trucks) supplies to Taliban when Iraq was boiling and FC paramilitary personnel assists Taliban fighters crossing across the border by replenishing them with food and water, returning from "hit-and-run attacks". A message clearly has to sent and further aid must be contingent on co-operation and strict audit on usage of aid. "Just listen to Obama! He is far more intelligent than Bush or McCain. If Bush can learn about foreign policy while in office, Obama can do so as well." I think you are confusing your personal liking of Obama and his charisma with intelligence. Obama had mediocre grades in Punahou and Occidental and yet got scholarships there and later at Columbia and Harvard. Well, Bush learned on the job and what a disaster he has been. That's what I am afraid of with novice Obama as president. "Can the world afford another Republican president for four more years, dictated by Neo-cons? Can we afford evangelical, extreme right- wing conservatives dictate US policy? Do we need another George W.Bush?" McCain is no George Bush. He's never gotten along with the conservative right-wing of his part. In fact, Obama now is more like George Bush circa 2000 as a complete novice. You are repeating the falsehoods spread by Indians and anti-Pak US media about Pakistan's role in Afghanistan. Musharraf was very personally and deeply committed to the war on terror that exposed him to great personal risk and eventually brought him down. Besides, do you think the US military presence would even be possible in landlocked Afghanistan without Pakistan's support? Just think about it. i favour Mccain over Obama but...Mccain has stated some "facts" about Obama which were all out lies not just half truths or he didnt like twist stories(like many politicians do) he spoke all out LIES!!! but in the end after weighing the pros and cons Mccain would be better for Pakistan Obama is sort of gambling on the whole Pakistan-Afghanistan situation.How in the world does he expect to be successful in a region where both the soviets and the British failed so miserably. The hate that exists in Afghanistan against the U.S alone would be enough to defeat the U.S army, diplomacy is the only way Obama needs to realise that.Its true that the war on terror has to be fought in Afghanistan and some areas of Pakistan but not by Obamas methods. I saw the entire debate and I was shocked by the statement because considering their political party, the statements should be switched. don't support McCain so quick, although he apologized for abandoning Pakistan in the 80's. he still did, he also has represented the same political party that has abandoned Pakistan time and again.earlier in the debate he said his hero was Ronald Reagan, what a great example of a wise forign deplomacy. in the united states military service is highly respected as in most countries.Obama being a public servent or providing community service to the poor. although highly respected as well, certain Americans don't believe Obama has the strength to be president. so at some point in the debate, he had to display some form of might, unfortunitly he had to use Pakistan as that example. but if you remember earlier in the debate McCain also talked about having a strong U.S. military, and when he described Pakistan he described it from a military perspective. "I've been to Waziristan. I can see how tough that terrain is. It's ruled by a handful of tribes." I know what the U.S. does with a large military.that is not good for Pakistan.If Pakistan needs someone at all, take my advice,root for the one who takes care of the poor. Riaz: I have been to FATA and I have seen how things are done there. I also know how any perceived threat by the US in Pakistan would be clearly counterproductive. I acknowledge your data on FATA. But think this through for a moment. McCain's (and your) "practical" approach stalemates in analysis-paralysis - we maintain status quo. And unless the top US commanders are crying wolf, the situation in FATA is worse than Afghanistan pre-911. What do you suppose the US response will be to another attack of the scale of 911 - from FATA? Does the President - whoever he may be - have any option but to launch a full-scale war on Pakistan? Be quite sure that McCain's war paint will be put on much earlier in that scenario than Obama's. McCain's position - and yours - implies the appeasement of the Taliban and Al-Q by bowing to their backers in the Pakistani Army. I hope we can agree that that at least is not an option. Another 911 scale attack on US soil will undoubtedly trigger a massive response no matter who is the president and regardless of the consequences for the US and the world. After such an action, we might even wish the "status quo" prior to it was better. It's much harder to build a lasting solution than to lash out with raw, naked power that almost never works in the long run. We have seen it amply demonstrated in the last seven years and throughout human history. There is a difference between precise surgery and mass slaughter. I give credit to McCain for at least talking about a lasting solution and trying diplomacy with Pakistan in FATA. I think all of you are looking at one debate in a high energy election. look at whats going on in our economy and both wars. McCain spoke about Russia. Obama spoke about Pakistan. but if either where in power they'd both re-examine their options in regards to those issues. the whole debate about what if there's another 9/11. which is silly considering the great work the world has with tracking their money,they have to move the money at some point. so the likely hood of such a scenario is slim to none. but of course we would bomb everything we think has anything to do with it. but at the very least, despite the loss of lives, American would be bankrupt. anonymous: We need a Winston Churchill type leader for war on terror. I hope that you and others (especially libertarian) can comment on this. Looks like Obama was right after all. McCain said he wouldn't go after Bin Laden in Pakistan, and Obama said he would....AND HE DID!! !....AND HE GOT BIN LADEN!!!! Of course History has proven Mccain and you to be wromg Haq! Obama was vindicated in what he said. The railway project will connect Pakistan with Xinjiang region in China and enhance the capacity of transportation between the two countries, said Sichuan University Chengdu China Pakistan Study Centre Director Dr Chen Jidong, while speaking as a key note speaker at a one-day seminar on prospects of Pak-China Relations at the University of Peshawar on Friday. The seminar was arranged by the Department of International Relations (IR), University of Peshawar, in collaboration with Institute of Policy Studies Islamabad. According to a report published in The Hindu on September 1, 2012, a portion of the railway track from Kashgar to Hotan in southern Xinjiang began in June last year, whereas work has not yet started beyond that. The line is planned to run from Kashgar, the Old Silk Road town, to Xinjiang region, the report said. Chinese strategic analyst Professor Zhon Rong said the taking over of Gwadar port by a Chinese company along with this new project can transform Pakistan into an economic giant of the 21st century. “Let me tell Pakistani people that Gwadar Port is first for the development of Pakistan and then for any other country. The US withdrawal by end of 2014 (from Afghanistan) would start the beginning of a golden period for Balochistan,” he said. “Gwadar port will always belong to Pakistan. The Pakistani government has handed it over to a Chinese company because the Singaporean Company who was in charge of port operations in 2007 could not deliver the desired results,” added Rong. “We have no favours or opinion to offer on talks of the Afghan government with the Afghan Taliban, but China does want to play a moderate and neutral role in Afghanistan,” he said. Department of International Relations Chairman Professor Dr Adnan Sarwar Khan said the old slogan ‘deeper than the sea and higher than the sky’ for Pak-China relations must be transformed into something tangible by boosting economic ties. “If other regional countries can have alliances and organisations like Nato, why can’t we have IPC (India Pakistan China) or APC (Afghanistan Pakistan China) cooperation to boost regional peace and economy,” he said. Institute of Policy Studies Director General Khalid Rehman, Pak China Friendship Secretary General Syed Ali Nawaz Gillani and a large number of students attended the seminar.